Kathy Hutton was a high school junior when she fell in love with her husband, David. Two years later, they were married and soon had son Graham and daughter Chelsea. David worked as a disc jockey for a local radio station and money was tight. Kathy Hutton with her husband David, who suffered a disabling stroke two years ago. In January 2014, David had a stroke after shoveling an unexpected snowfall that had kept the couple from Lebanon, Missouri, home for the day. Kathy had been napping when she heard a crash in the kitchen. She found David, then 53, on the floor, his speech slurring. At first, she thought he was just tired from shoveling snow, but when David tried to support himself to stand, his right arm gave out. At the local hospital, he received the clot-busting drug tPA and was transported to a stroke center in Springfield, Missouri, where testing showed swelling in his brain. Doctors performed a craniotomy, temporarily removing the left bone flap of David’s skull to relieve the pressure. The stroke had caused significant damage to the left side of his brain. “He lost control of the entire right side of his body,” Kathy said. David spent several weeks in the hospital, and nearly six months in a rehabilitation center before going home. At the time of his stroke, David was being treated for high blood pressure and high cholesterol. He had a family history of heart disease, losing family members on both sides to heart attack. “I always figured he’d die of a heart attack too, but I never imagined he could have a stroke,” Kathy said. 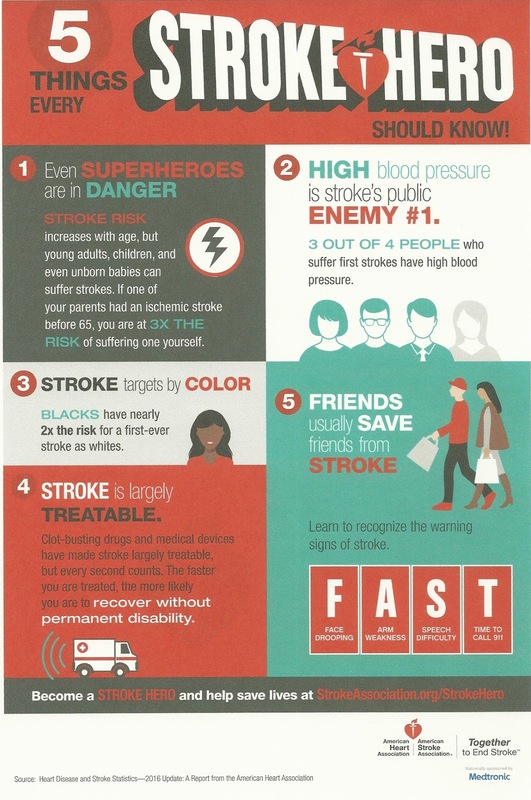 Stroke is the No. 5 cause of death in the United States and is a leading cause of disability. David now spends his days in a motorized wheelchair or a recliner chair. A home health aide comes each day while Kathy goes to work as a cemetery administrator. The Huttons, who recently celebrated their 33rd anniversary, can no longer afford rehabilitation therapy due to reductions in Medicaid benefits. David can stand briefly, but not much else. His speech is limited to a few words, along with gestures that Kathy does her best to translate. “Sometimes he gets really angry, and so do I, because I can’t always figure out what he wants,” she said. Kathy gets encouragement and some help from extended family and friends, as well as Graham, who is now 30, and Chelsea, who is 25. On the rare occasion she can get away, Kathy goes to a movie or eats out with a friend. She found a local support group but can’t attend because it meets when she’s at work. As hard as coping can be, Kathy said it’s the little moments she misses most. One bright spot for the couple has been visits from their four grandchildren, who are all under 6 years old. Iowa: Our Season Has Begun! Our season has begun! We already have four camps under our belt. Camp is all about being yourself and embracing life again when stroke works overtime... Stroke survivors and caregivers need a break from the stress of everyday life. They even need a break from each other! We know that survivors need to engage with other survivors. Caregivers need the same outlet. Our three-day weekend camps blend all the essential ingredients of what "normal" folks enjoy. In April we did one in Iowa, in May we did one in Miami, Florida and this weekend we have two at the same time, one in Prescott, Arizona and one near Tucson, Arizona. So far we have 28 camps scheduled for this year and there are a few more pending. As I get photos from each camp I will post a few of them on this blog. It's still a bit early in the spring and the trees haven't quite filled out yet. And maybe a wee bit chilly but those Iowans are a hardy bunch. And all of our activities are done indoors anyway except for this evening marshmallow roast and there may be some fishing during the day if anyone is up to it. We started taking registrations at Camp Courageous around two o'clock Friday afternoon. Of course the volunteers started setting things up way before that. Like around eleven in the morning. As is customary we open every camp with a drum circle. two of our very experienced and talented music therapists, who were also the camp directors this weekend. Our theme this year is the 1980's. We start by forming teams for the Saturday night 80's game show team competitions. Each team chooses a name and makes a poster. More about Saturday night later but first I wanted you to see what else we do during the day. And whatever the heck this is. Camp Courageous also has a rock climbing wall as do a couple of our other camp locations. Yes, that is a stroke survivor stepping outside his comfort zone. That happens a lot at our camps. Remember I mentioned the 80's and Saturday night. Well I can't tell you everything. You'll just have to come to a camp and see for yourself what goes on there. The camp wraps up around noon Sunday and there is a lot more going on than I can show here. If I can get a hold of some pictures I'll show you next week what happened in Miami last week. Rest assured, I will eventually. The XFINITY internet is under maintenance and having problems so this week's blog will not be posting a camp report as I planned. Please stand by and hopefully they get things working by next weekend. Please go to this web address to look for camps in your area. Last March you were introduced to Laura through her article titled "Personal Testimony of Laura T. Barnett". If you wish to review that article, click on the archive link for March at the right of your screen. This is an excerpt from Chapter 1 of her unpublished book, Blink Twice If You Mean Yes. I find out much later from a speech therapist that I have a condition known as DYSARTHRIA. It differs from aphasia in that the muscles involved in speech have been affected by the stroke like the lips, tongue, diaphragm, etc. BLINKING – A NEW WAY OF TALKING! Mike, Mom, and a nurse were talking to me. They were probably wondering how much of what they were saying reached me. What a great idea! Now they’ll know that I understand what they’re talking about. Trying to focus on them, I remembered that they were brown, and I blinked for no. I blinked twice for yes. I blinked once for no. I blinked twice for yes, which was correct. This question, I had to think about. I blinked one time while thinking about it, and then one more time, which again was right. Copyright notice: Please do not copy or forward any part of this blog article without written permission from Laura T. Barnett. If you wish to do so, please leave a comment on this article with your contact information. The following is a re-posting from the American Heart Association News website: news.heart.org. Nicole Enteado woke up on Nov. 29, 2014, thinking about a fun day of holiday shopping she had planned. But after about a half hour of lounging around, a strange sensation suddenly came over her. “It was almost like feeling drunk,” she said, adding that she also began drooling. She reached for a glass of water, but her dominant left hand wouldn’t move. Using her right hand, she took a swig, only have it dribble down her chin. Confused, Enteado made her way to the bathroom, her legs feeling oddly heavy. Looking in the mirror, she saw the left side of her face was drooping. Although she was experiencing all the classic symptoms of stroke, Enteado didn’t realize it. “I was 26 and healthy and active. There was no way I could be having a stroke,” said Enteado, who lives in Newport, Rhode Island. Panicked, she called her parents, but by then her speech sounded garbled. Her parents thought it might be an allergic reaction so a friend drove Enteado to her parents’ home 20 minutes away. They took her to the nearest hospital, where testing revealed she was having a stroke. By then, nearly three hours had passed since her symptoms first began. Enteado’s speech was completely gone and her left side was paralyzed. Enteado was given a clot-busting medication called tPA, which must be given within the first 4 1/2 hours after the onset of stroke symptoms, and transferred to a larger regional hospital. Over the next two days, the feeling on Enteado’s left side returned, along with her speech. She spent a week in the hospital, and then another six weeks rebuilding her strength at home through yoga. It was a bumpy recovery, as Enteado overcame lingering weakness and grappled with what had happened to her. “You think of yourself as healthy, but it was like my body had failed me,” she said. She experienced anxiety, which is common among stroke survivors. It took about six months for her to feel normal again; Enteado still remembers the relief she felt the day it happened. Enteado’s doctors aren’t sure what caused her stroke, but pointed to her history of migraines and use of birth control pills as potential contributors. Throughout her life, Enteado suffered from constant headaches that would develop into debilitating migraines several times a year. “My mom got them and my grandmother got them, so I didn’t realize that wasn’t normal,” she said. Enteado now works with a neurologist to prevent migraines, which unexpectedly became more frequent following her stroke. She also takes blood thinners to minimize the risk of another stroke. The only other lingering effect from her stroke is mild numbness that can make it difficult to control the left side of her face when she’s overly tired, though it has been subsiding with time. Stroke is the fifth-leading killer of Americans, and a leading cause of disability. The experience has motivated Enteado, now 27, to raise stroke awareness in hopes that others will recognize the symptoms – face drooping, arm weakness, speech difficulty – and call 911 quickly, no matter their age. Looking back, Enteado said she now realizes she wasted valuable time by going first to her parents’ house when her symptoms began. “Knowing what I know now, I would have gone straight to the hospital,” she said. Enteado works for jewelry and accessory brand Alex and Ani. Inspired by Enteado’s experience and stories from other stroke survivors, the company released a special bangle, available Wednesday, evoking a butterfly motif called “Wings of Change.” Alex and Ani will donate 20 percent of the purchase price to the American Heart Association/American Stroke Association. The company’s “Best Friends” bangle, released in 2012 to commemorate heart health, has generated more than $3 million for AHA. The experience changed Enteado’s perspective on life, helping her to let go of the little things that used to stress her out.